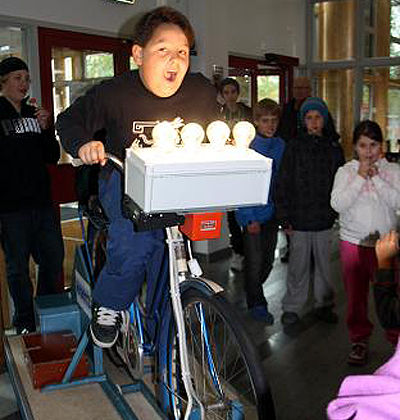 A visitor at Researchers’ Night in Skellefteå 2010 discovers how much energy is required to keep the light bulbs illuminated. Participants can use various tools to study and measure how much electricity different household appliances consume. You could also add more practical activities such as generating sufficient electricity by peddling on a stationary bike to illuminate light bulbs. The activities should be run by researchers. Target group: Suitable for a broad target group. Preparations: Appoint someone who can run the activity and decide on a venue and format. Organise the materials and researchers. Market the activity. Challenges: Obtaining the necessary materials and finding a good venue for the activity. Benefits: Makes a concrete connection between people’s everyday lives and research.